WASHINGTON—People in tornado danger areas are being given the wrong survival advice resulting in unnecessary loss of life, according to a tornado shelter expert. “The thing right now that we are combating is this concept that the only safe place is below ground or … if you don’t have an underground shelter you need to flee the storms,” says Larry Tanner, research engineer and specialist in storm shelters at the Texas Tech University. People in Oklahoma do not take tornadoes for granted, Tanner says, but he blames television meteorologists and news outlets for encouraging people to flee storms. That only leaves people vulnerable in cars, a bad place to be in a storm, he said. He referred to destructive tornadoes that hit parts of Oklahoma City Friday, May 31, trapping rush-hour commuters who were attempting to beat the storm home. 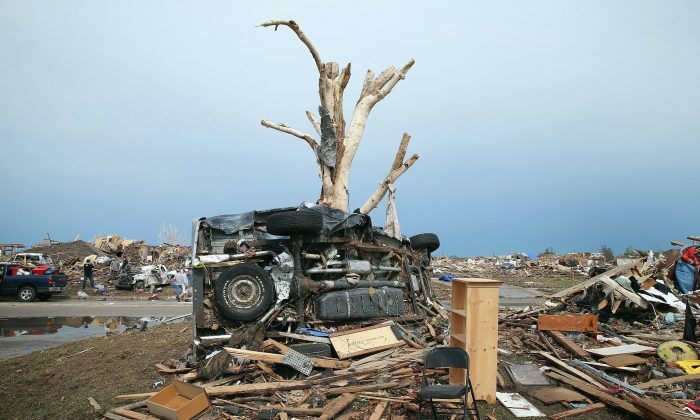 At least 7 of the 16 people who died were in cars, including three storm chasers. Tim Samaras, 55, was one of the storm chasers to lose his life Friday near El Reno, Okla., when a tornado changed direction. Samaras was founder of the tornado research company Twistex and a respected scientist whose work had been featured on National Geographic and the Discovery Channel. His son, Paul Samaras, 24, and Twistex meteorologist Carl Young, 45, died with Samaras. While cars can be rolled over, blown out, and impacted by debris, hiding in roadside ditches can be equally dangerous. Among the 16 killed last Friday were three children and two adults swept away after trying to shelter in a storm drain, Reuters reported. “You need to get out of the car and seek the relative safety of some structure, not try to flee, especially when you are in a metropolitan area,” Tanner says. Tanner has investigated “zillions” of tornado and hurricane sites, he said, including Hurricane Katrina where he was a member of the Federal Emergency Management Agency (FEMA) mitigation assessment team. He has just returned from assessing Moore, the Oklahoma city flattened when an EF5 tornado hit May 20, killing 23 people. Of the 200 or so aboveground shelters registered for Moore, he was able to inspect around 60. “They had certainly been hammered,” he says. Some had marks on the walls where they had been hit by some “pretty sizable debris,” but bolted or welded together and firmly anchored to the floor, they had survived pretty well. In some places, the house was totally destroyed while the shelter beside it remained upright and secure. “Lots of lives saved in those shelters,” he said. Texas Tech’s Wind Science and Engineering Research Center (WiSE) specializes in the design and testing of storm shelters, and recommends aboveground shelters more than underground. Many local governments, however, including Moore’s, recommend underground tornado shelters. They tend to be outside in older residences and inside garages in newer homes. Tanner says underground shelters can be effective but do present problems particularly if there is rising water or heavy rain. Maintenance is also critical—ventilation equipment and doors pose potential vulnerabilities during a storm. Residents in Moore complained of difficulties getting in and out of underground shelters, he said, and a number of the shelters had only one lock on the door, a contravention of FEMA requirements to have three locks. “One fellow said every time his shelter door got hit by something the lock would pop loose, so he spent the whole time holding the lock in place,” Tanner says. In another case, an underground shelter inside a garage became flooded when the water heater blew over. The shelter contained six people but luckily it occurred near the end of the storm. The people were able to get out, but the shelter had totally filled up.